During the early years of silent movie production, Chicago is the home of many motion picture firsts. Here is a list of the more important ones. Dr. Jekyll and Mr. Hyde, by Selig Polyscope Co. Presented in strict accordance with the original book, as to scenery, costumes and dramatic cast, involving each, detail of pose, gesture and expression. Pictured from the dramatization executed by personages of indisputable dramatic ability. The successful reproduction of this well-known drama has surpassed our expectations, knowing that great care must necessarily be exercised in its rendition. Its complete presentation must pay special tribute to the fact that only strong perseverance and persistence on the part of those engaged in its production has brought about this success, permitting us to assert that we now have one of the few exceptionally clever productions which impress the onlooker with every feeling of deep emotion, drama and tragedy enacted by the original company. The leading role and character part executed by the man who plays the double life of Dr. Jekyll—at times Mr. Hyde is convincing that no greater display of ability to fulfil this role could be shown by any actor. The other characters prove, by their able support, that the entire dramatic cast is one which does justice to the book itself. To mention that this conception was written by Robert Louis Stevenson is sufficient recommendation of its eligibility to class it among the foremost interpretations of moving pictures. The play itself is known to every man, woman and child, while its dramatic supremacy has brought it before the world with universal popularity. No matter when, where or how displayed, whether staged or shown by pictures, this attraction gets the business. No better subject, and few so good, has been attempted to the present date. The slightest irregularity before the camera -would have marred the production, and without this mar we have the most professional picture obtainable. Throughout the performance the scenes are as realistic as in any theater. Act I.—Stage view of theater. Curtain rises and discloses a garden scene and view of the Vicarage and Church. Vicar and choir enter the Church for evening prayer and song, during which time the love of Dr. Jekyll for Alice, the Vicar’s daughter, is presented in a pathetic manner. Then comes the transformation of the moral and physical character of Dr. Jekyll from the admirable gentleman and scholar to the ferocious brute of a maniac known as Mr. Hyde. He is irresistibly addicted to a drink of his own mixture, one of his medical discoveries. It sets him wild and his other self reigns supreme. This change is remarkably characterized and displayed with a dramatic ability almost beyond conception. He attacks his sweetheart. Her father, the Vicar of the Church, approaches and interferes. With fiendish glee and demon strength, Hyde kills the Vicar, disappears, and the next moment is “seen as Dr. Jekyll. Act II.—In the office of Mr. Utterson, a lawyer in Chancery Lane. Although counsel for Dr. Jekyll, Utterson’s suspicions are aroused as to his guilt. Dr. Jekyll visits the lawyer’s office. When left alone he becomes remorseful and has a vision of the gallows with a noose around his neck. This important feature is shown in a most realistic manner, then the scene changes to introduce just enough comedy to bring emotion to the sentimental sort. Act III.—Includes a scene in the office of Dr. Lanyon, a friend of Dr. Jekyll. At midnight Dr. Lanyon sees, a crouching figure on the portico of th’e building. It is Hyde, who when he enters changes to Dr. Jekyll by taking a single draught. Dr. Lanyon is overcome and prostrated with astonishment. Act IV.—Reveals the mystery of the double existence lived by Dr. Jekyll. Scene 2 shows Dr. Jekyll’s laboratory and his last struggle for supremacy of his real being. Here he is visited by Alice, still unknowing this man to be the murderer of her father. This thought, together with his intense love for the girl, drives him to despair. She leaves, expecting to see him again to-morrow; on tomorrow which never comes. He drinks again the awful drug and when changed to Mr. Hyde poisons himself to kill the Dr. Jekyll whom he hated. 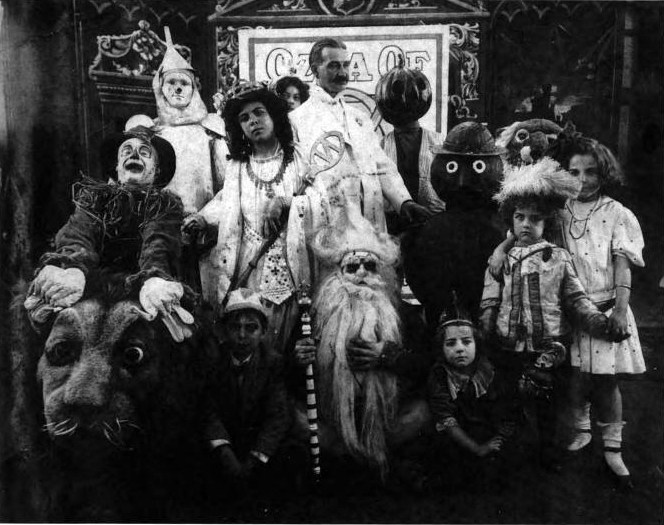 The film portion of the presentation contained 60 minutes of material based on Wizard, Land and Ozma of Oz, a 20-minute preview of Dorothy and the Wizard in Oz (while Gillespie and Remus sold books in the lobby), which had not yet been published, and 40 minutes of material on John Dough and the Cherub. In addition, there was approximately one hour of live stage acting (with the actors in the film appearing and interacting with L. Frank Baum) and magic lantern displays. The films were colored (credited as “illuminations”) by Duval Frères of Paris, in a process known as “Radio-Play”, and were noted for being the most lifelike hand-tinted imagery of the time. Baum once claimed in an interview that a “Michael Radio” was a Frenchman who colored the films, though no evidence of such a person, even with the more proper French spelling “Michel”, as second-hand reports unsurprisingly revise it has been documented. 1900 Mar. 26 – The Selig Polyscope Production Co. releases a new feature film, The Wonderful Wizard of Oz. Baum may have written the scenario for this and later Selig film releases. 1900 April 19 – The Selig Polyscope Production Co. releases a film short, Dorothy and the Scarecrow in Oz. Selig releases both this and The Land of Oz as payment for his last investment in the Radio Plays (1908). The films use either outtakes or new material reusing sets and costumes from the Fairylogue and Radio-Plays – opinions differ, and no authoritative records remain. This film had been thought lost. On October 1, 2014, the San Francisco Silent Film Festival and Cinematheque Francaise announced that a print of the film had been found in the Cinematheque’s collection. The SFSFF and the Cinematheque will restore the film, with the European premiere to take place in January 2015, and the U.S. premiere in May 2015, exactly 99 years since the 15 May 1916 premier. The print found is a nitrate negative of the 90-minute film with French-language inter titles. The film had been mixed up with other Holmes-related media at the Cinematheque and had been incorrectly labeled. Hampden); A “Suffraget” (Marion Skinner). Sherlock Holmes, while out for a stroll with Dr. Watson, meets a beautiful woman. They are mutually attracted, but pass without recognition. Later Holmes is engaged by a noble family to recover papers involving the family in a scandal, and which are in the hands of a woman, whose sister was ruined by one of the members of the noble family. She is holding them in order to get revenge. Holmes discovers that the woman who holds these papers is the one that he had passed in the street, and to whom he was so singularly attracted. He tricks her out of the papers, but returns them to her, telling her that he believes that she will eventually give them to him of her own accord. He points out to her how much better it is to let the matter rest than to connect her own name with scandal in order to get revenge, not only on the man who caused her sister’s unhappiness, but on the innocent members of his family. Holmes then goes to Watson’s house, where he sends a note for the woman who holds the papers to meet him there. His cab driver, who is waiting outside, is the leader of the band of crooks. Holmes has penetrated his disguise, although the crook does not know this. Holmes brings him into the house under a pretext, and there slips handcuffs on him. He has also sent for the nobleman to come to Watson’s house. He has Dr. Watson place the woman in a rear room so that she can overhear his conversation. He then turns over a package of blank papers to the nobleman, pretending he thinks they are the right ones. The nobleman berates him for having been duped Sherlock admits it, and cries that he is ruined. The woman then rushes into the room and through her love for Sherlock gives up the real papers. The nobleman leaves satisfied and as Watson shows him to the door, Holmes slips his arms about the woman, and tells her of his love.